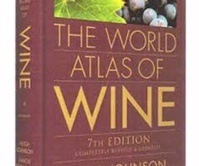 If you consider only one wine book for the wine lover on your gift list this holiday season, I strongly suggest "The World Atlas of Wine" by Hugh Johnson and Jancis Robinson ($55, Mitchell Beazley). Though there are many other options, this book is most important, in my humble opinion, because it is the seventh and latest edition of what I consider the most useful wine reference work in my library of wine. It is useful because it is comprehensive and authoritative, and it is useful because the authors are trusted sources on all things to do with wine. Johnson has been writing eloquently and accurately on wine for nearly half a century. His "Pocket Wine Book" has been published annually since 1977. Jancis Robinson is a Master of Wine, author of "The Oxford Companion to Wine" and wine columnist for Financial Times. What these two bring to "The World Atlas of Wine" is a treasure trove of knowledge distilled into a format that is easy to navigate, informative and highly entertaining given the tremendous writing prowess of these two gifted storytellers. This new edition of "The World Atlas of Wine" is the first since 2007 and covers a good deal of territory that either didn't exist or was barely underway when the previous edition was published. It is well understood that a vintage statement on a bottle of Champagne is an indication of superior quality. The Champagne region of France, about an hour from Paris by train or car, is so far north that ripening patterns from year to year can be tricky, complicating life for those who would wish every year to be a vintage year in Champagne. Sadly, it isn’t. When nature hasn’t been kind, most reputable Champagne houses abstain from declaring a vintage. But even then, all is not lost. Non-vintage, or what some would call multi-vintage Champagne, is the bread and butter of the industry. And, contrary to what a reasonable person might conclude, non-vintage Champagne hardly means bad Champagne. The clever Champenoise have devised a system that ensures there will always be outstanding bubbly to pop open for the holidays, no matter how lean the harvest might have been in some years. The reason is simple: Top Champagne houses hold back a portion of their production from each of the good vintages. These reserve wines are blended with the best wines from the so-called “off” vintages to achieve consistency of quality and to craft a house style. A Champagne house lives and dies by its reserve stocks, largely because non-vintage Champagne represents the bulk of production. The storied Piper-Heidsieck Champagne house offers a good example of the importance of reserve stocks. Over a period of a couple of decades in the 1980s and early 1990s, Piper allowed its reserve stocks to dwindle. The quality of Piper’s non-vintage brut suffered as a result and the reputation of the house cratered. 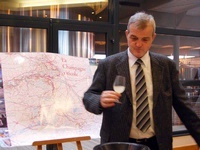 Winemaker Regis Camus joined the winery in 1994 and was elevated to Chef de Cave in 1998, when he embarked upon an ambitious plan to restore the tarnished Piper-Heidsieck reputation. To accomplish his goal and speed the return of Piper to elite status in the world of Champagne, Camus refused to produce vintage Champagne in some very good years. It raised eyebrows, but it worked. Its reserve stock replenished, today Piper-Heidsieck’s non-vintage brut is among the finest in Champagne. Over the past six months I’ve had an opportunity to taste a number of top non-vintage Champagnes at two major international wine competitions: Critics Challenge in June and Sommelier Challenge in September. Champagne, in particular non-vintage brut, shined at both. Charles Heidsieck Brut Reserve ($65) – This beautiful multi-vintage Champagne took a platinum medal at the Critics Challenge. It is rich and creamy, with notes of brioche and a remarkably long finish. Charles Heidsieck Rose Reserve ($80) – Charles Heidsieck is the kissing cousin of Piper-Heidsieck. It was made famous to some extent by its incredibly rare tetes-de-cuvee “Champagne Charlie.” The Rose Reserve may not be as rare, but you won’t be disappointed in this powerful, inviting bubbly that can be matched with savory cuisine and hold its own. Also a platinum medal-winner at Critics Challenge. Moet & Chandon Brut Imperial ($42) – This workhorse non-vintage brut was awarded a gold medal by judges at the Sommelier Challenge in September. Sommelier Challenge is a unique wine competition in which all of the judges who evaluate the entries are certified sommeliers. This beautifully balanced multi-vintage brut Champagne is one of the finest non-vintage bruts I’ve encountered from Moet. Mumm Cordon Rouge ($49) – Mumm underwent a renaissance in the cellar that was very similar to that experienced at Piper-Heidsieck. Under the guidance of Chef de Cave Dominique Demarville, who has since moved on to become Cellar Master at Veuve Clicquot, Mumm stormed back to prominence in the late 1990s. Its flagship wine, the rich, toasty non-vintage Cordon Rouge, is now as good as it ever was, and it won a gold medal at the Critics Challenge earlier this year. Perrier-Jouet Grand Brut ($55) – This brilliant Champagne house in Epernay is a model of consistency, but that said I do believe the Grand Brut is better now than it’s ever been. This one took a gold medal at the Critics Challenge (all of the judges are renowned wine journalists). It is firmly structured and has the potential to evolve beautifully with additional age, though it is meant to be consumed upon release. Piper-Heidsieck Brut ($50) – This lovely wine won a platinum medal at the Critics Challenge and in my humble opinion is the finest value in non-vintage brut Champagne today. I recently purchased several magnums for less than $70 apiece, which works out to about $35 a bottle. If you can find a similar deal where you shop for wine, my advice would be to load up the cart! Choosing appealing and delicious wines for the holidays is the easy part. Getting the most out of them requires attention to a few small but important details. First and foremost, there is the temperature factor. Do not keep your wines prior to the holiday feast in the kitchen, or on the counter next to an oven that's roasting a 20-pound turkey. Red wine served too warm will taste flat, and in some cases tannic or acidic. 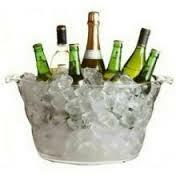 And if you live in a cold climate and have the heat cranked up, it wouldn't hurt to invest in a plastic party bucket so you can keep both your red and white wines cool while resting on a bed of ice. In fact, it is often recommended that Beaujolais, the wine of choice for many at the holiday table, be served slightly chilled. This is especially true of less expensive Beaujolais-Villages. The second most important detail, in my humble opinion, is the decanter. 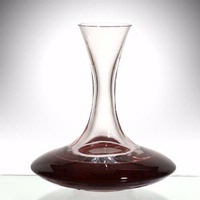 With an emphasis on fruit-driven wines during holiday feasting, the decanter is an invaluable tool in the quest to enhance the wine component, and thus the overall experience, as you entertain. Decanting your wines — both red and white — provides aeration, which brightens the fruit and smoothes the rough edges. It is not necessary to possess fine crystal to decant. Most department stores sell inexpensive glass decanters that work every bit as well as crystal, albeit without the elegance. If you are so proud of a special bottle or bottles of wine being presented at the feast, do what many sommeliers do: Decant the wine, rinse the bottle, and then funnel the decanted wine back into the original bottle. That way you won't lose the "wow" factor of an impressive wine selection. Finally, there is the matter of the stemware used for your wine service. I am fond of the quaint practice of "seasoning" the glasses before the wine is served. This is mostly for show, a stylistic twist that calls attention to the festiveness of the occasion. But if you haven't had time to polish your stemware and it's been sitting in the cabinet for any length of time, seasoning the glasses will help remove any off aromas that have accumulated in the cabinet. To season the glasses around your dining table, simply pour a small amount of wine in a single glass and swirl it about, coating the inside of the glass with the wine about to be served. Then pour the wine from the first glass into a second glass and repeat the process. Continue until you have seasoned every glass. For the greatest impact, this gesture of showmanship should be done with everyone seated at the table, each person seasoning his or her own glass before passing the wine to the next person's glass. This is a festive custom and certain to kick off any holiday occasion with a burst of flair.